GIVE ‘EM THE AXE! GIVE ‘EM THE AXE. GIVE ‘EM THE AXE…. We all know who. The Stanford State Indians–that’s who! This famous college football yell is not politically correct, today. No doubt it’s a bit too violent for today’s tender-eared youth. We know the name Indians is frowned upon by the PC crowd–which makes us want to use it even more—but that’s another column. Saturday is the Big Game. And each year a column with this title appears. Like the Game, itself, it’s tradition. Folks assume that for a game to be “Big” something has to be on the line– the Conference Championship; the Rose Bowl; or the holiest of holies–The BCS (whatever that means) Championship. That, of course, is to miss the essence of college football. Despite the bad press, scandals and under the table activities we read about, first and foremost, college football is about student-athletes competing against one another. Sure, there are some thugs. And, yes some kids are just passing through on the way to the pros. But for the vast majority of seniors, this is the last football game they will ever play. So the combination of adrenaline, coupled with the “Ya ain’t got nothing to lose” mentality inherent in one’s final game, make for some extraordinary moments in sport. We’re not talking about a rivalry where each year Heisman Trophy Candidates rise up to accomplish Herculean feats. 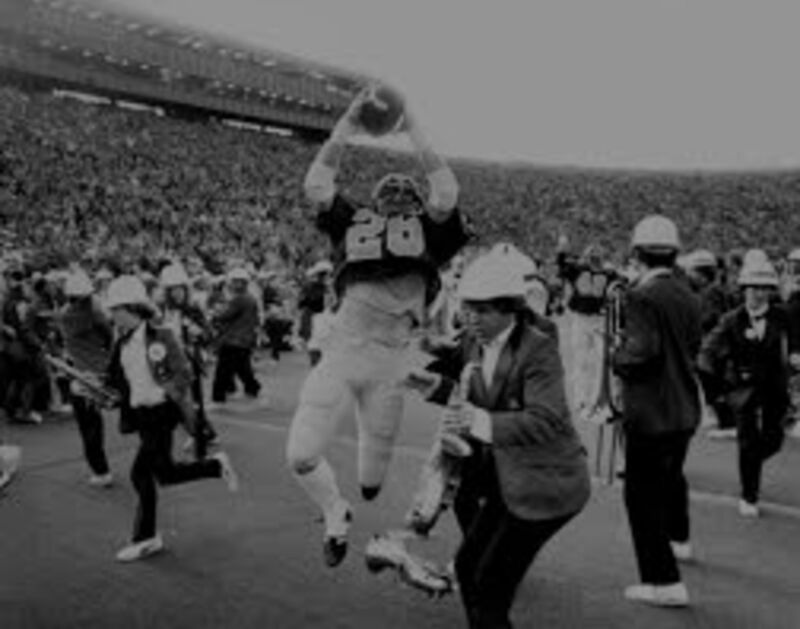 No, from Hart and Patton stopping Skip Face short of the goal line on the last play, and sending the Bears to the Rose Bowl fifty years ago, to Kevin Moen knocking over the Stanford trombone player to win the ’82 Big Game with no time left on the clock–the rivalry is rife with “Ordinary Joes” accomplishing extraordinary feats. The Beauty of “The Old College Try” is that it is not dependent upon physical prowess alone. Heart, determination, courage, guts and grit are the ingredients of “TOCT.” It does not rely upon superior genes or talent. It is a state of mind–dependent solely upon the depth of one’s character and the size of one’s heart. “The Old College Try” is not delivered in a vacuum. It is witnessed by family. One of the finest “families” one could ever be associated with–Old Blues. Ordinarily, as you read these words, I would have disappeared from the earth as you know it. On Big game Thursday, I leave the Valley to join the “family” and do not re-surface until Sunday. My days and nights are filled with other rummies like myself. But this year is different. Due to the horrific fires, Big Game was wisely cancelled until today. And blessedly it is once again the last game of the year. In a normal Big Game week there are dozens of reunions throughout the City. Wherever one gathers, it is the best one of the week. For us, The Mother of them all is the Friday Men’s lunch. It was started over years ago at the now defunct New Pizza. It was mostly ruggers, and former footballers–boys, Coach Joe Marvin once called “The fellows who fought the Battle of Berkeley back in the 60’s”. We know what he meant. No parents wanted their kids to come to Cal back then. We were considered a bunch of Commie, Pinko, Weirdoes. It’s a wonder football survived. My friend defined the lunch with this classic line: “No invitations. That means no jerks. “Just good guys inviting good guys”. We gather to re-tell the same old, stories–laugh way too loud–and return to the halcyon days of yore when everything was possible, and no one could best us–neither footballer nor female. Ours is a friendship held together over the years–not through our triumphs, but through our failures. For that’s where the laughs are. In the screw ups. In the errors in judgment. In the vain attempts to be more than we were. Had we been suave. Had we been cool. Had we succeeded each time–in class–on the field–with the co-eds– we’d have little to talk about. And nothing to laugh about. When the sentence begins with “How ’bout the time…….” you can be assured it has nothing to do with a triumph. Mostly it has to do with some humiliating failure which the PCer’s would consider a lowering of self-esteem–and which we consider too funny for words. The world would never approve of our past shenanigans. It certainly wouldn’t approve of the way we laugh about them now.